The intensity of the last few weeks has been almost beyond description, and certainly unmatched in my career as a theoretical physicist. For me, and for many of my colleagues, the end of a decades-long hunt for the Higgs particle comes with a sense almost of disbelief. Did this really just happen? Did the years and years of anticipation, which had become almost a part of our communal culture, a sort of Waiting For Godot, a hope for a Promised Land always out of reach, actually come to an end? Since before I was an undergraduate student, experimental particle physicists have been looking for the Higgs particle (or “Higgs boson” as it is called within the particle physics community). It was the 1960s when the notion of the Higgs particle as we know it today first arose; and since that time, one search after another aimed at finding it had come up with nothing, despite a few false alarms. Almost every year or two, researchers would report that a certain range for the mass of the simplest possible type of Higgs particle (the “ Standard Model Higgs”) had been searched and declared empty. Searches for more complicated Higgs particles also drew a blank. Failure became normalcy. Meanwhile particle physicists discovered particles called “quarks”: three types in the 1960s, two more in the 1970s and a sixth in 1995; in the 70s and 80s the “tau lepton”, a heavy cousin of the electron, turned up, as did a third neutrino; and the particles associated with the strong and weak nuclear forces, the gluons and the W and Z bosons, were found. And yet, among all of these great discoveries, no Higgs particle. Looking back on it now, we can see how bad luck maintained the suspense. Had the mass of the Higgs particle been ten times smaller, we would have found it decades ago. And there were several close calls. With collisions just ten percent more energetic, the European Large Electron-Positron (LEP) collider would have found this particle at the turn of the millenium. Had the American machine, the Tevatron, managed to reach its maximum expected collision rate during the past decade, it would have found strong and perhaps convincing evidence two or three years ago, rather than the moderate supporting evidence that it conveys today. And had the Superconducting Supercollider (SSC), the gargantuan American machine, been built, rather than being cancelled in 1993, it would have found the Higgs a while back. But discovery, and fame, fell to the lesser giant, the Large Hadron Collider (LHC). Though smaller than the SSC, with collisions at lower energy, it made up for its deficiencies by providing more collisions per second — and by simply surviving. And so it is that the CERN laboratory, where the W and Z particles were discovered, again celebrates a dramatic contribution to scientific knowledge. My days visiting CERN following the July 4th announcement were packed with discussions about the data and the future. Is it a Higgs particle, or could it possibly be something else? If it is a type of Higgs particle, are the hints of evidence that it is not of the simplest type persuasive? What are the key measurements to make next, and how precisely can they be made with the data that will be obtained through the rest of the year? Papers (not all of them accurate) started pouring out onto the computer archive where theoretical physicists post their work as they complete it (in “preprint”, i.e. pre-publication, form). Keeping up with those papers, and weeding out the erroneous ones, was a collective effort, with individual theorists at CERN telling each other over coffee what they’d learned from their reading, and cross-checking whether the claims made in this or that paper made sense or not. On top of this I also had daily exchanges with experimentalists from ATLAS and CMS (the two general-purpose experiments at the LHC) both about the details of their current results and the need for additional measurements in coming months. Before I could catch my breath, CERN hosted a five-day workshop (from Friday the 13th through Tuesday the 17th, including the weekend), covering not only the Higgs discovery but all of the other results from ATLAS, CMS, and their cousin experiment LHCb. In addition to preparing a presentation for that workshop, I had to give a second talk a few days later at a three-day “Higgs Hunting” conference at Orsay (just outside of Paris, France). With all of this happening at once, you can perhaps understand why at the end of each day I collapsed heavily into my hotel bed! Left: The north rose window of Notre-Dame cathedral in Paris (Photo: Julie Anne Workman, via Wikipedia). Right: The inner tracker of the CMS Experiment at the LHC in Geneva (Photo: 2008 CERN). After an image composed by Daniel Denegri, for his presentation at the Orsay Higgs Hunting 2012 conference. On the left, one of the great rose windows from Notre-Dame Cathedral; on the right, a photograph of the interior section (the “tracker”) of the CMS detector. Both have a certain beauty, with elements both symmetrical and asymmetrical, colorful and intricate; and both reflect an extraordinary level of commitment and dedication on the part of their creators. During lunch, following Denegri’s talk, I mused upon this juxtaposition. On the face of it, these two great wheels of color have nothing whatsoever in common; the first was designed to adorn a giant monument to the glory of God (and to the glory of Paris and its bishops); the second was designed as a precision device, wires color-coded merely for ease of identification, with no aesthetic goal, and whose purpose is functional: to measure the trajectories of particles as they travel outward from a particle collision inside the LHC. And yet, they both reflect something essential about the cultures from which they were spun. The window is a small though aesthetically important part of Notre-Dame, a vast edifice soaring into the sky toward the heavens… and built over decades by expert architects, engineers and craftsmen, employing state-of-the-art techniques. The CMS tracking chamber, similarly, forms a small but functionally important part of a vast underground temple to the very universe itself, whose purpose is no less than to unlock secrets of existence… also built over decades, by expert physicists, engineers and contractors working with state-of-the-art techniques. Culture has changed, and ways of knowing the world have changed; but what has not changed is the willingness of society to transcend daily life, to imagine the spectacular and profound, and to set armies of people working together in service of a higher calling. After the conference ended, I finally let the Higgs particle slip out of my mind. I wandered slowly down toward the Seine, the river that threads through the heart of the city, and descended the stairs to the walkways that run just above river level, well below the flood walls that support the city streets along the waterfront. I walked under the Pont Neuf, watching the tourist boats pass by, and gazing up at the Ile de la Cite’. 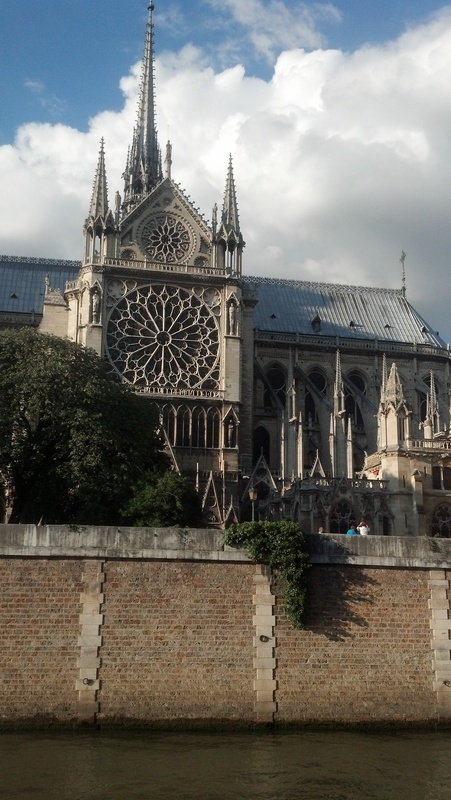 With the graceful flying buttresses of the cathedral, and the tracery of its south rose window, rising up above me on the opposite bank of the Seine, I sat down quietly and took in the view, absorbing the reflected late afternoon light. Meditating on the eight centuries that separate us from the builders of Notre-Dame, I found myself envisioning a time eight centuries from now, when perhaps the cathedral will still stand. What will remain of the LHC? The accelerator will long ago have been dismantled, with a few small parts saved and distributed to museums and universities as historical curiosities. Neither ATLAS nor CMS will sit prominently upon a city square; they, too, will have been scrapped. Maybe the LHC’s tunnel will have found a more prosaic use, or will have been filled in to prevent it from collapsing with age. No, what the LHC will leave behind will transcend the physical realm. Knowledge, once obtained and settled, belongs to everyone. Only four hundred years ago it was not known that the same force of gravity that holds us to the ground keeps the Moon in orbit around the Earth, and the two of them in orbit around the Sun. But today this forms part of our basic knowledge about the world, taught to every child. Nor is it abstract knowledge: every satellite launched, every astronaut safely returned depends upon it. Eight hundred years from now, perhaps only scholars will remember the LHC, but every document that describes the physics of nature in detail will mention the particle that the LHC has just discovered. And should it prove true, as widely expected, that this is indeed a Higgs particle, its story may well occupy a chapter all its own, indirectly recalling and celebrating the epic enterprise that made its discovery possible. This, at a minimum, will be the LHC’s legacy. As the sun began to set, and the walls of Notre-Dame glowed richly in the light, I thought of the mammoth task that the Bishop Maurice de Sully put to the city of Paris; how, motivated by a combination of faith and ambition, he persuaded his city-state to put its weight behind this superhuman construction, one that gave to humankind an inspiring edifice for all future generations to admire. And how a small group of theoretical particle physicists, motivated by a desire for foundational knowledge about the universe, and obtaining insights from their equations about how the universe might work, persuaded their colleagues to devote years of their lives in the preparation of a immense particle accelerator, and convinced many nations to back the project — all so that humanity might ask profound questions of Nature. 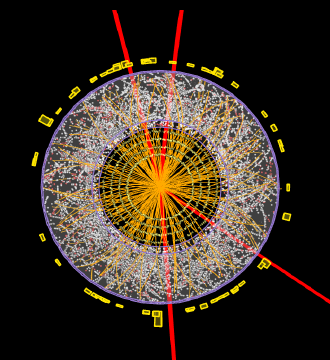 A collision of two protons, as detected in the ATLAS experiment and displayed in a computer-generated visual representation, in which a Higgs particle may have been created, which subsequently decayed to two muons and two anti-muons (red lines). Shown in Fabiola Gianotti’s July 4th presentation announcing ATLAS’s strong evidence for the existence of a new Higgs-like particle. Lo and behold, to one such question an answer has come — in fireworks, and flashes of light. Proclaimed across the globe, it shines forth for everyone, and all future generations, to admire. It demonstrates also the inherent understanding some great people have of what actually constitutes natural beauty. In the window of Notre Dame the marvellous harmony and pattern of colour interwoven with supporting structure shows a need by the builder to demonstrate something really really abstract and exquisite, something among others, now revealed by knowledge as fundamental physically, objectively. It’s almost taking the beauty of a nautilus shell, and turning it back to front. If you can believe in beauty, then you can stick with the search for the wave, and now youve found it really does have have a particle, and you seem right on to as a pack. Viva Science. I personally don’t see the difference between scientists and artists really, except that one is messier than the other. An artisan is an engineer, human dissection is Michaelangelo business, charts are drawings, maths is perspective and I like science better than art atm. Which isn’t to say i definitely won’t make a painting about it. I saw a great programme on bbc4 called the secret life of waves, which was brilliant. And I keep up my interest on what’s going on at cern this year, because I knew this was to be the big year. I’ve kind of latched in the same way as the apollo missions, except the theory is difficult for me to manage in any but the most basic of ways. I had to teach myself the rudiments of chemistry along with a few other things earlier this year or I would have missed the sense of excitement it’s brought me. So I’m glad I read the dummies guides to Newton and Einstein, and measured the wavelenth of laser beam with a micrometer, and read Shrodingers Kittens, and came to this site when I did. Great stuff. Thank you for sharing your thoughts about your trip. Also, I love the Daniel Denegri image. If human kind survives eight hundred years from now, which is not sure, who can say for sure that the Higgs boson and the whole Standard Model would still be part of the theory used by physicists to describe nature? And is it not possible that this model would have been replaced by something totally unknown to us, and as far from current knowledge as the Standard Model is from the medieval Four Elements representation of nature? By the way, thanks to CERN for the world wide web. I’ve seen posters that map it, and they look like starbursts, too. Nice article. Very well put. Thanks very much. And from the position of an interested layman I say congratulations to all involved in this massive achievement. Hey, I think your blog might be having browser compatibility issues. When I look at your blog in Chrome, it looks fine but when opening in Internet Explorer, it has some overlapping. I just wanted to give you a quick heads up! Other then that, awesome blog! an internet business plan and start making money online. to come, such as internet marketing. obtain latest updates, so where can i do it please help out. Κeep on writing, ǥreat job!